The Erasmus Student Network (ESN), who has been acting for the enrichment of society through international student mobility for more than 25 years, strongly welcomes the recent declaration of the European Union Education Ministers, not only because of the values it outlines, but also due to the joint commitment expressed by the European Commission and the Member States. 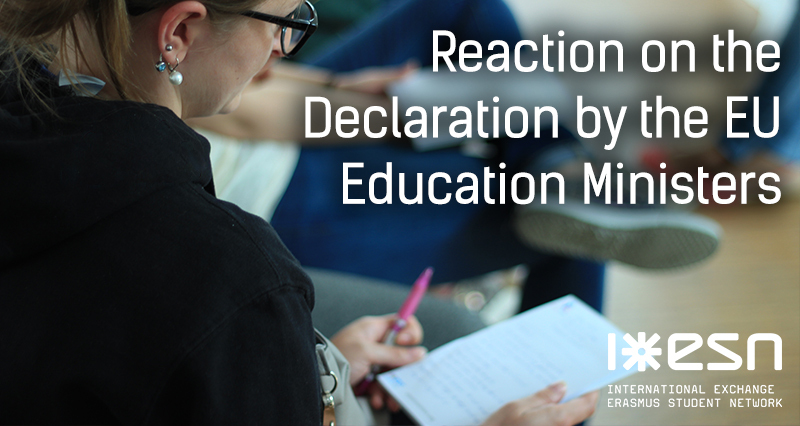 ESN would like to highlight some dimensions of the declaration and would like to push for stronger commitment regarding international learning mobility. In the midst of the terrible events that struck France and Denmark recently, we strongly agree that the first long-term answer lies in renewed commitment and investment in education at all levels. Only a comprehensive educational strategy that places equal attention in developing knowledge and skills and in fostering active citizenship, tolerant and culturally-open attitudes will lead to the desired goals. ESN also strongly supports the engagement of Member States to foster dialogue between all education stakeholders, in particular associative structures. In fact, involving young people themselves in shaping new education methods and goals is instrumental in creating a sense of ownership and belonging, which is absolutely crucial to successful education. ESN believes that international learning mobility under all its forms offers extremely high potential to help reach all the goals mentioned along the declaration. Given its central place in 21st century education, mobility should be supported by all authorities, from the local to the European level. Involved parties should not only rely on the Erasmus+ programme, but also encourage local, regional and national mechanisms in order to develop the accessibility and the quality of mobility opportunities. Regarding Higher Education, the commonly agreed target for 2020 of 20% of Higher Education graduates who would have experienced international learning mobility during their curriculum will not be achieved without a comprehensive commitment from stakeholders at all levels. Therefore, we call the upcoming Ministerial Conference (May 2015, Yerevan - Armenia) to address the question of the accessibility of mobility to all young people and students. This future opportunity should be taken to reach an agreement on clear national recommendations to support mobility as an ideal tool to ensure the multicultural identity of Europe. The Erasmus Student Network, as a pan-European wide-reaching grassroots civil society organisation, commits to support the European Union and the individual member states in reaching goals expressed in the declaration through the action of its thousands of volunteers, dedicated to the cause of a united and culturally open Europe. ESN equally commits to support mobility in order to make every student’s mobility experience, a quality European citizenship experience.